Barbel are a great species to target and are found in rivers, as this sort of habitat is really suitable to barbel. Their streamlined body, enlongated head and beautiful brassy flanks make Barble perfectly adapted to life in flowing water. 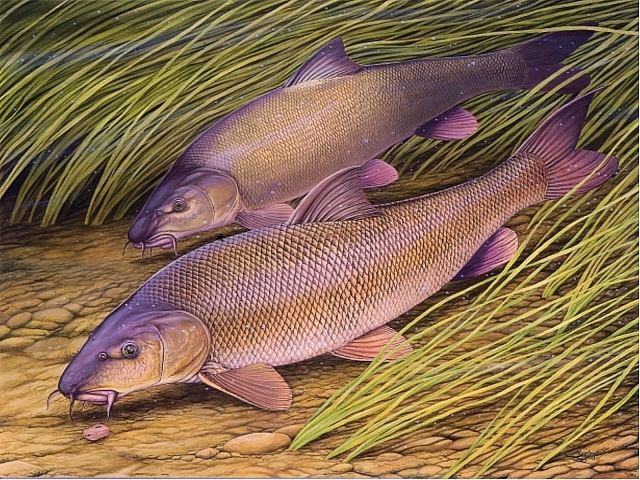 Barbel graze the river bed like sheep, foraging around the bottom, often overturning stones in search of tiny morsels of food. A good area to locate Barbel is where there are boulders and an abundance of streamer weed as these areas offer sanctury and cover, as well as being a haven for an abundance of food! Often a good place to try is just on the edge of the main flow and the steadier water which is often found about a third of the way across the river from your own bank. These areas are good spots to put a bait, especially on warm summer days because the Barbel will often hold up in these areas as a way of getting out of the strong flow, thus preserving their energy when oxygen levels are low because of the warm weather. It is well worth targeting Barbel in the autumn and many people regard this as the best time of year for a big Barbel! Pellets are the most commonly used bait for barbel these days, but luncheon meat will work well on its day! Other good baits for Barbel are maggots, worms and casters, but its always been known that Barbel really love hempseed! Fishmeal boilies are also a great Barbel bait. So get out there and bag yourself a Barbel!! !